Peet’s Coffee and Tea recently released two very-limited-edition coffees, Kenya Peaberry and India Peaberry beans. I had the opportunity to sample both, and can recommend them. Both are $18.95/lb. 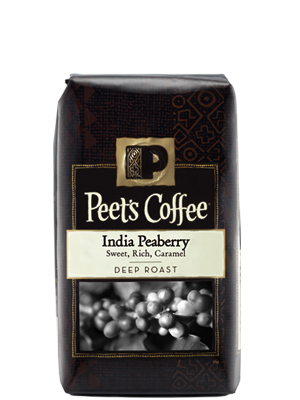 and available by ordering online through August 20, and you can buy the India Peaberry beans at at your local Peet’s (including the San Francisco Bay Area). The end date for purchasing at local stores varies depending on location. The Kenya peaberry grows at an elevation of 5,000 feet. The coffee bean results in a cup of coffee that is full-bodied and features subtle hints of caramel and vanilla. The India peaberry, from Elkhill Estate in India, brings bold, sweet flavors to coffee brewed from these beans. Elkhill Estate is UTZ certified, meaning coffee produced from there meets strict environmental, social, and economic criteria. This gives Elkhill Estate employees access to housing, healthcare, a living wage and a crèche (day nursery) for working mothers. 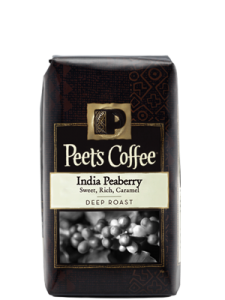 After the peaberry beans come from India and Kenya, they are roasted at Peet’s LEED Gold Certified Plant in Alameda, California. There are only three roasting dates for these very limited editions: August 7, August 14, and August 21. After roasting, the coffee is packed and shipped on the same day. To find the Peet’s Coffee & Tea near you, use the Peet’s online store locator.